After 36 hours of travel, touching three continents, we have arrived safely in Lusaka, Zambia. For most, this journey began last November when applying to participate in Gonzaga-in-Zambezi, and after a semester of learning, reading and preparing, we couldn’t be more excited to touch down on African soil. Here are a few notes from our journey so far. 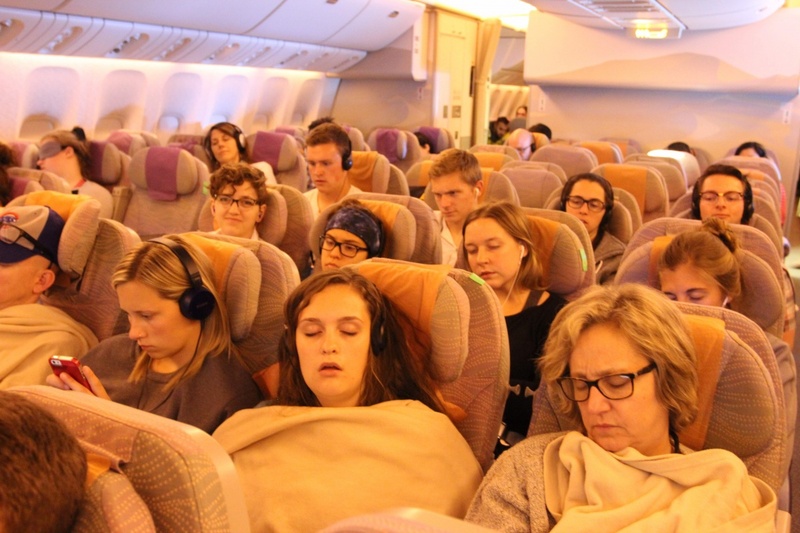 After an uneventful 14 hour flight from Seattle to Dubai (complete with hot towels and first-run films), we arrived to Dubai on Tuesday evening. Emirates Air lodges travelers with overnight layovers, so we hopped on a minibus with a few other passengers. We drove into the city and we pulled up to a large sparkling and extravagant building. We remained in our seats waiting to be delivered to our hotel, as the people in the front of the bus got out and went into the building we were parked in front of. A man in a khaki vest and pressed white shirt motioned us to get out; this was our hotel. We felt a surge of excitement run through us as we thought of our last guaranteed hot showers and finally getting to lie horizontal to sleep. Despite the long flight that had taken us over the North Pole into the Middle East, we didn’t want to miss an opportunity to explore this remarkable and somewhat overwhelming city. 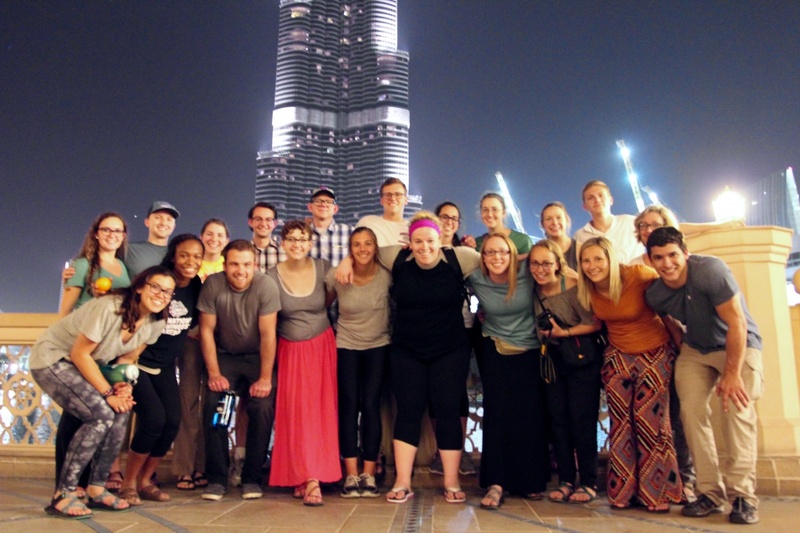 We dropped off our stuff and headed out to tour the city of Dubai. As we drove, the four-lane roadway was filled with sports cars (Ferraris, Lamborghinis, and Maseratis all zipped by) and lined with giant billboards. The bus driver then pointed out the tallest building in the world, the Burj Khalifa. It didn’t look over 800 meters tall until we got closer and through the fog we could see the surrounding skyscrapers lining the horizon. It was impressive to say the least. It’s blinking lights created a tall pointy tower stacked like adult legos into the sky. We saw more of the city, including the Palms man made islands and Atlantis Resort, the Dubai mall, and then headed back to our beautiful hotel. The city’s uninhibited wealth and outrageous infrastructure gave us pause as we pondered our final destination. With exhausted eyes we headed to our hotel and rested up for another day of travel, this time finally on our way to Lusaka, Zambia. We know that Lusaka, and Zambezi on Friday, won’t look or feel much like Dubai, and we’re excited get our first glimpse of the community that has been a home to so many Zags before us. Enjoy your journey everyone! Looking forward to following along. So happy to see this picture of all your bright yet exhausted faces! I remember that journey oh so clearly. That feeling of being completely disoriented to time, place, and people. Lean into that feeling and lean on those around you for support. Conner House and I have been continuously refreshing the blog waiting for the post. I was overcome with joy when I bumped in the Cecilia at Starbucks informing me of your blog update, followed shortly by an excited text from Conner saying your team had made it safe! I’m so happy and thankful for each one of you who decided to enter onto this journey. Look around you, these will be the people you never forget from college! Lean on God and each other and know that there is no “wrong” way to go to Zambia just make it authentic to who you are as a person and your own personal leadership style and strengths. All my love from Spokane (yes Kenzie and Josh, I am still in Spokane… Refusing to leave. Haha ) awaiting your next post! I have been refreshing the blog since Tuesday night and was constantly freaking out when I didn’t see a new post, but I am SO glad to hear that you have all made it safely to Lusaka! Holy smokes, it’s crazy to think how much you all have traveled and seen and experienced in the last 36 hours while I’ve been here, in Spokane, grocery shopping and saying my farewells to some of my dearest friends. WELCOME to place you have all been so anxiously awaiting! I can only imagine the surge of emotions you all must be feeling (and the exhaustion) but embrace it! This is the exact moment and place in which you were meant to be! Embrace every emotion, accept every opportunity that presents itself and just be. Zambia will make itself known to you. I’m sure that I can speak for a lot of the past Zags that we are all living vicariously through you! Sending prayers and love from over 10,000 miles away! What a fascinating way to juxtapose your next experience. Although I’m sure you appreciated the marvel of what man can do with resources. I’m excited to be following you all once again. My prayers are sent out to each and everyone of you. Josh, continue to expand the definition of global citizen for these students as the world needs more of that. Students, wait to you see his dance moves! Kenzie, I am so excited and happy you chose to challenge and grow in his experience. I couldn’t have chosen a more loving person to go. You are so loved, everyone of you. Send me love to a boy name John, Mama Love, and Sandu! Glad you all arrived safely. Looking forward to future reports. I’ve been anxiously refreshing the blog since yesterday evening! So SO good to see your faces again and hear that you have touched down safely (despite Jeffs preconceived beliefs(; ) in Zambia!!! Ahhhh! Sending all my love and honestly most of my thoughts(as I sit in job training) your way! Ps. Josh you were right about MOD pizza. SO yummy and fun. Thanking the Lord for your safe travels and praying you are able to rest well and be ready for the discoveries ahead. Enjoy! Blessings to each and everyone of you! Any room on the bus for one more? Jk I am blessed to follow your travels via blog though I’d love to be on the bus with you. Remember To take a moment to “slow down” as you exithe final plane and smell Zambian air. LEEEETTTTSSSSSS GOOOOOOOOO! Glad you are all safe and sound, we love the photo and cannot wait to start reading the reflections! PS. Is it weird that we miss you people already? Hi Josh and hello Zags! Some of you may ask who’s Lynda McCann? Im just the Mom of one of the 2013 Zamfam members and loved seeing how much this adventure shaped my daughter. Without knowing any of you personally, I’ve still been so excited for this years trip. The blogs you will all take turns writing describing your experiences are my favorite summer reads…no pressure but the 2013 and 2014 groups set the bar really high. So enjoy it all, journal every experience…big and small…make lasting friendships with the beautiful people in Zambezi who in turn will teach you more than you will ever learn in a classroom! Katie, Peter, Venezia, Reilly — lots of ilys and don’t forget to take those deep breaths. Wowza what a weird feeling to be on the other side of the blog post! As I sit here in the brisk Spokane sun, I close my eyes imagining the familiar sights, sounds, and smells you will all come to love (and hate at times). Like it was said above, I cannot wait to live vicariously through ya’ll this summer as you start your next adventure of learning and of growth. In the past couple of days and in the next month you will have had an onslaught of experiences that may throw you all over the place, but be patient with yourself and watch what lens you are viewing the experience with. Open yourselves to whatever experience this was meant to be for you. I am so excited for each and every one of you with a special shout out to Riles, Collin, and Allie. (Hi Team! Miss you guys) I am thinking of you all and praying for the 2015 Zamily. Send my love to Mama Kwatsu when you get to that beautiful yellow home! Oh my gosh. I’m now one of those creepy people who follows this blog that nobody on the current trip actually knows, but who I feel like I already share a bond with. Hannah, I am so beyond jealous right now and I miss you and have been thinking about you non-stop. Can’t wait to conquer the world together. Josh, keep em in line eh? Tine! Cecilia! Conner! Lilly! So happy to see your lovely names. You still hold such a happy place in my heart. I can’t begin to express how excited I am for all of you. It sounds like it has already been an amazing few days and you have hardly begun. I truly believe that a trip like this will leave a mark on all of you forever. We hold you in our thoughts and our prayers and wish you safe travel, open hearts and warm showers! Patay!!!! So proud of you. I hope you are having a blast. Your blog is so fun to read. Missssss you!